Let’s get one thing straight first: Thomas B. Dewey was not the fairly liberal Republican governor of New York who ran for the U.S. presidency in 1948 and--despite most predictions and one famously incorrect newspaper headline--lost badly to Democratic incumbent Harry S. Truman. No, that was Thomas E. Dewey. The author under consideration here is Thomas B. (for Blanchard) Dewey, whose two-decades-long career, stretching from the 1940s through the ’60s, left us with more than three dozen novels, most of them featuring one of two private detectives: the memorably compassionate Mac, and the happily married Pete Schofield, the latter of whom is responsible for the crime-solving in Go, Honeylou (1962). received a Bachelor of Science in Education degree from Kansas State Teacher’s College (now Emporia State) in 1936 and did graduate work at [the University of] Iowa in 1937 and 1938 before moving to California, where he received his Ph.D. from UCLA in 1973. Dewey held a number of writing and editorial jobs during his career, including a stint with the [U.S.] State Department, a magazine editorship, and several years with a Los Angeles advertising agency. He also taught English at Arizona State University for several years before turning to freelance writing on a full-scale basis. Another source says this author was married twice, first to Maxine Morley Sorensen in 1951, and then again in 1972, to Doris L. Smith. Dewey’s debut novel was Hue and Cry (1944), which concerned “a small-town girl who finds herself pregnant and unmarried.” It introduced readers to Singer Batts, a Shakespearean scholar and bibliophile who owns a small hotel in the fictional town of Preston, Ohio. Like Rex Stout’s Nero Wolfe, Batts “is given a full slate of eccentricities,” observed critic Jon L. Breen in his Dewey profile for the Summer 2008 edition of Mystery Scene magazine: “his hobby is studying historical murder cases; he compulsively writes to lonely-hearts clubs; in deliberate reversal of the Wolfe pattern, he is painfully thin owning to a tendency not to eat; he drinks only to face contemporary murder.” The humble Batts is “one of the most reluctant detectives who ever tracked down criminals,” added Ray Broadus Browne in Heroes and Humanities: Detective Fiction and Culture (1986). He “does not like having his reading interrupted and often will not pay attention to anything said or done to him before he has finished a chapter in a book because he ‘can’t stop in the middle of a marginal note.’ Yet when on the trail of criminals Batts is witty, clever, and unrelenting as well as slothful. As is his hard-nosed helper, the manager [of his hotel], Joe Spinder.” Dewey continued interrupting Batts’ peaceful reading through three more novels--As Good as Dead (1946), Mourning After (1950), and Handle with Fear (1951)--before leaving him to the cool company of his bookshelves. Over the course of more than two decades, Dewey produced 17 Mac novels. The best of those might be 1954’s The Mean Streets (which critic Breen counts among the 25 best private-eye novels of all time), A Sad Song Singing (1963), How Hard to Kill (1962), and Deadline (1966). But I also enjoyed The Case of the Chased and the Unchaste (1958), which sends Mac off to sunny California to help an obdurate film producer whose daughter appears threatened with abduction. A light-hearted character with little in common with Mac save his first-person style, Pete is married to a beautiful redhead named Jeannie. Married private eyes are relatively rare. Brett Halliday had tried a similar situation early in the Michael Shayne series, but madcap Phyllis was such an irritating character, he wisely killed her off. Jeannie is much easier to take. That’s precisely what happens in Go, Honeylou. Schofield takes $500 from Pierce Bonwell, an itinerant tent-revival preacher from Texas, in exchange for his driving north to San Francisco with Bonwell’s beautiful, too-trusting, 19-year-old blonde niece, Honeylou, and depositing her there with her “aunt” Cindy. One look at Honeylou (“Six feet of honeysuckle and magnolia; buttermilk, biscuits, and bourbon”), and Jeannie is glad she decided to come along for the ride. It’s pretty slow going at first, what with stops for hearty repasts and Honeylou taking time out for five-mile-long runs down the highway in her skin-hugging shorts and abbreviated sweatshirts (behavior guaranteed to slow traffic to a rubbernecking crawl). However, when Schofield is clobbered by a mountain of malevolence known as Eddie, and the girl and Jeannie are snatched, the pace of Dewey’s storytelling really picks up. The private investigator doesn’t even wait long enough to fill the local cops in on this kidnapping’s specifics, before speeding off toward the Golden Gate, where he thinks--or at least hopes--Eddie has taken them. Predictably, Aunt Cindy turns out to be something other than the generous relative Schofield was led to expect; she also turns out to be no longer breathing. And though our hero finally retrieves his spouse and his “bright-eyed and burstin’” young charge, he can’t keep them safe, but instead winds up imprisoned along with the women in a backwoods cabin, under the watchful gaze and firepower of Eddie and his quick-tempered Mexican partner, Ampara. Whether the captives can escape depends on Schofield’s deviousness--and maybe his seductive skills as well. While this plot isn’t the newest thing under the sun, the story’s madcap aspects and the playful relationship between Pete and Jeannie Schofield make Go, Honeylou a pleasurable read. Along with the nonsensical but entertaining Too Hot for Hawaii (1960), the wonderfully titled The Girl with the Sweet Plump Knees (1963), and Only on Tuesdays (1964), Go, Honeylou probably ranks among the finest of the Schofield novels. Oh, and The Golden Hooligan (1961) isn’t half bad either. Until only a few years ago, when I stumbled upon a first-edition Dell paperback copy of Go, Honeylou stacked among my late father-in-law’s books, I’d never read anything by Thomas B. Dewey. The fact that my wife’s father had enjoyed his work didn’t guarantee that I would like it; our tastes in crime fiction often diverged. But I was finally won over by this book’s cover, with its eye-catching suggestions of pulchritude and peril. Some of the best mystery novel covers of the [1960s] were painted by Victor Kalin. If Teason’s works could be described as “cheery,” Kalin’s works could be called “dramatic.” He illustrated many Mary Roberts Rinehart books. Sometimes he would follow the Teason approach, and show a still life of clues on the cover--for example, for The Great Mistake. ... But more often Kalin’s approach was architectural, showing buildings and landscape scenes from the story. His illustration for The Window at the White Cat is a visual pun. The White Cat is a somewhat crooked political club; in the novel it is housed in an urban building. Kalin makes it an elaborate white house for his cover, somewhat Gothic and gingerbready. But if you look at the cover at a distance, the house turns into the face of a white cat. The windows of the house become the cat’s eyes, etc. It is a very clever visual illusion. Kalin’s portfolio extended well beyond these examples, however. He illustrated novels by Kelley Roos (The Blonde Died Dancing), Helen Reilly (The Opening Door), Louis Falstein (Slaughter Street), Frank Kane (A Real Gone Guy), Donald Hamilton (Assignment: Murder), Harold Q. Masur (Murder on Broadway), and so many other crime writers. 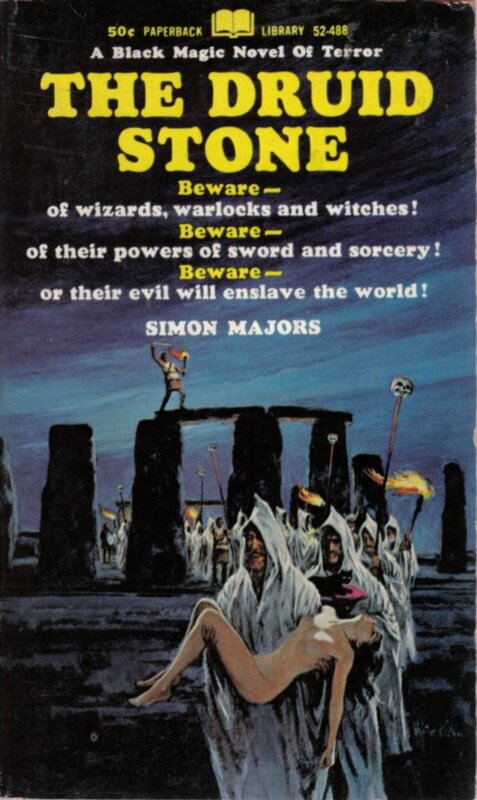 In addition, Kalin’s illustrations can be seen fronting terror novels such as The Druid Stone, by Simon Majors. For Go, Honeylou, Kalin created what appears to be a reflected-in-the-mirror image of the titular Texas miss, slipping out of a dress while gripping a horn-handled revolver. That illustration isn’t inspired by any scene in the novel that I recall, but it works splendidly. And it’s accompanied by an inset image of detective Pete Schofield. While the Schofield books carried jackets not only by Kalin, but also by Barye Phillips, Ron Lesser, and others, that little Schofield badge--or a slight variation on it--was consistent on the Dell paperback releases of this series. It assured readers that they were in for a criminally good, if sometimes kooky reading experience. In addition to the three series mentioned here, Thomas B. Dewey composed short stories for Ellery Queen’s Mystery Magazine and other periodicals, and standalone novels that were published both under his own name (such as My Love Is Violent , Hunter at Large , and A Season for Violence ) and under the pseudonym Tom Brandt (Run, Brother, Run, 1954). By the time of his death in 1981, at age 66, Dewey had seen one of his Mac novels, 1953’s Every Bet’s a Sure Thing, turned into an episode (“Death Is a Double Cross”) of the 1971-1976 William Conrad P.I. TV series, Cannon, and he’d been elected a director-at-large of the Mystery Writers of America. Unlike the 1948 GOP presidential candidate, this Dewey was clearly a winner. Which makes it particularly regrettable that his oeuvre has fallen out of print. Dewey, opine co-authors Bill Pronzini and Marcia Muller in 1001 Midnights: The Aficionado’s Guide Mystery and Detective Fiction, is “one of detective fiction’s severely underrated writers.” Adds Jon L. Breen in Mystery Scene: “Of those writers who worked away at the private-eye form for a score or more novels, Dewey ranks in the top handful.” If you get a chance to read these novels, follow my lead: take a chance and dive right in. READ MORE: “Doing Dewey Up Delightfully,” by J. Kingston Pierce (Killer Covers); “Noir Art: Victor Kalin,” by Chad de Lisle (Noir Whale). Dewey spent the latter part of his life in Brady, Texas, and was the mentor (and ex-father-in-law) of the late Texas mystery writer Barbara Burnett Smith. Another excellent post. Makes me curious to add Dewey's work to the enormous stack of pulp paperbacks on my nightstand. Great article. I've read several Dewey's and enjoyed them. Regarding Mike Shayne being married in his early books --- I liked Phyliss! Tom Dewey never lived in Texas, though he is buried in his wife's family plot in Brady TX. He spent his last years teaching at ASU in Arizona. He is greatly missed to this day by his family and friends. It was an outstanding post! thank you for sharing ti with us! !